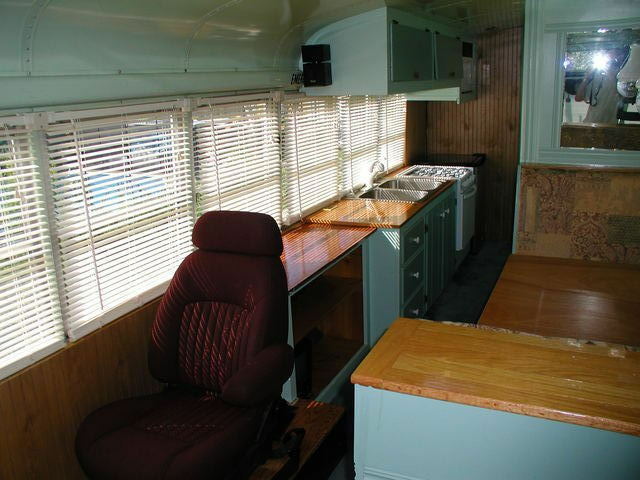 I chose the colors for the cabinets and partitions to honor the origins of the vehicle so the walls in the front of the bus - the "salon" - are painted with Glidden's "light tourmaline" which is the closest color I could find to the original school bus interior green. 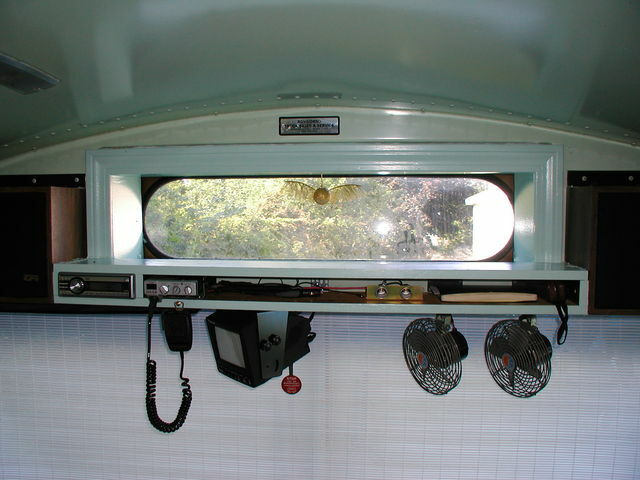 The window pillars and ceiling which are currently school bus interior green will ultimately be painted white - perhaps over a textured wallpaper to create a faux Victorian tin ceiling effect. Over all I've tried for a mid-20th century look with a eclectic mix of architectural elements - I wanted it to look like a cozy-but-dated seaside cottage or beach house. 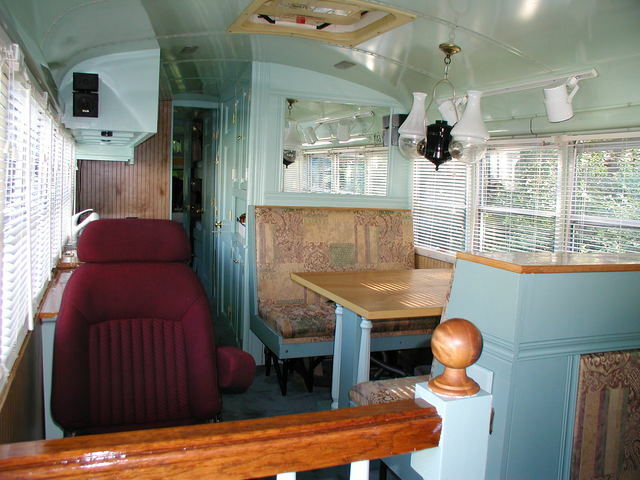 The carpeting came from a friend's dinning room, it was in exceptionally good condition and the single 10 x 12 foot piece was just enough. 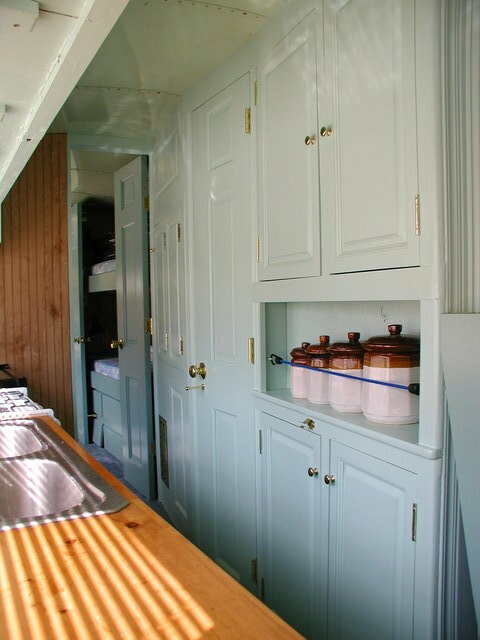 The kitchen cabinets are two-tone, the slightly darker drawers and doors are painted with Glidden's "Mystic Seaport", the next darker color on the "light tourmaline" color card. 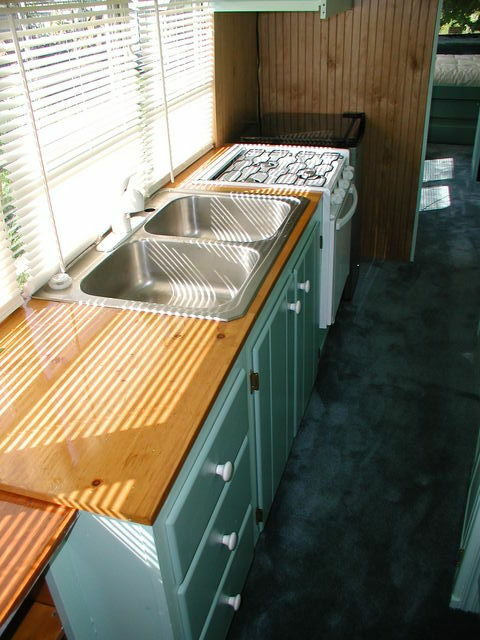 The counter tops are birch plywood with 3 or 4 coats of polyurethane varnish - they were salvaged from a kitchen renovation via Craig's list. 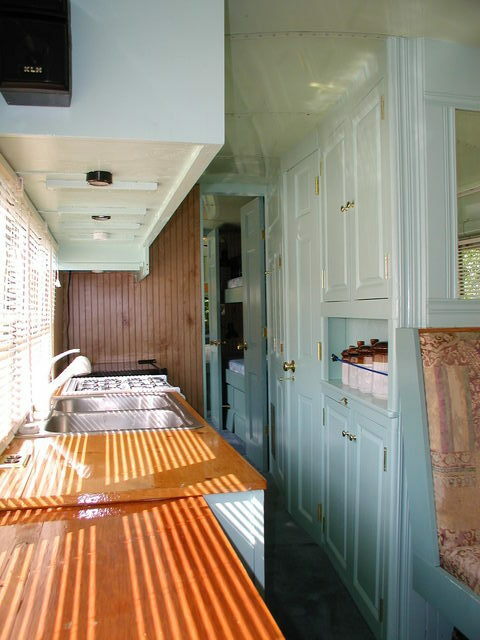 The pantry area and door to the bath. 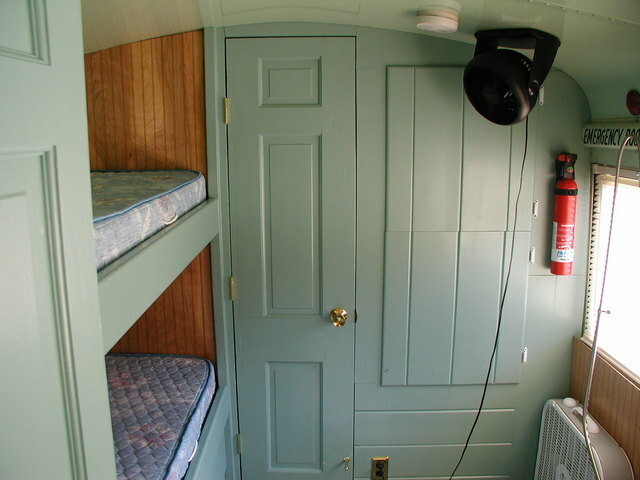 The forward wall in the bunk room is painted with Glidden's "Mystic Seaport". 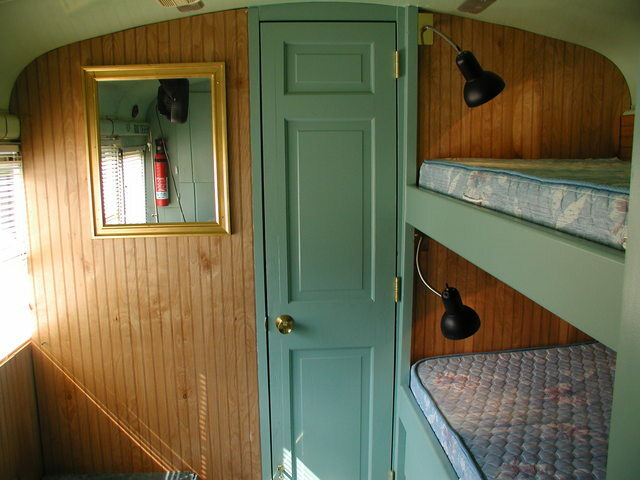 The back wall of the bunk room. 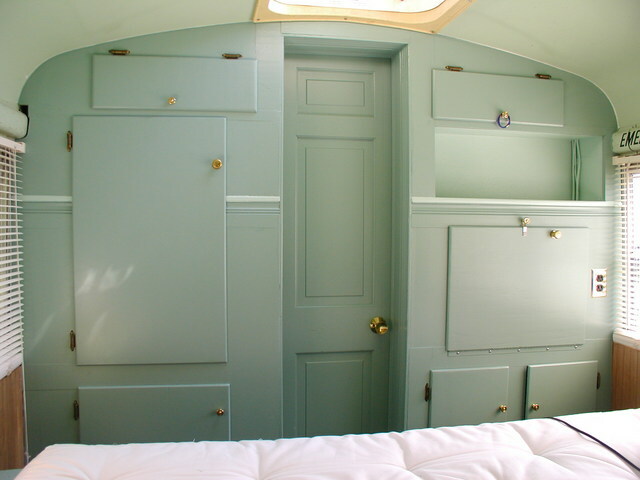 The forward wall of the master bedroom is also painted with the "Mystic Seaport" but it looks slightly lighter in this photo because it was taken later in the day. 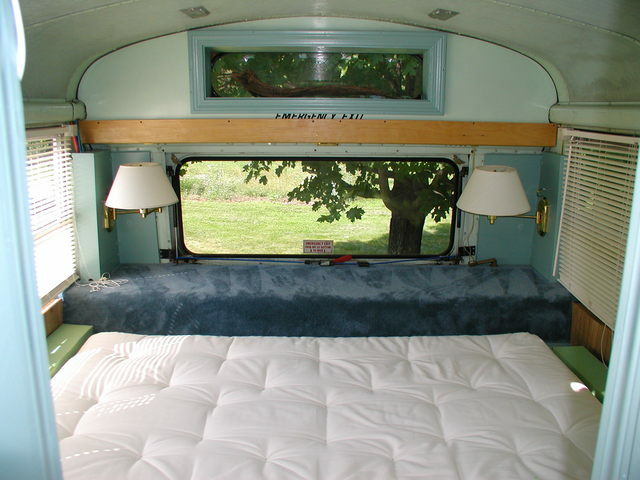 The rear "hump" is also carpeted and makes a nice night stand. 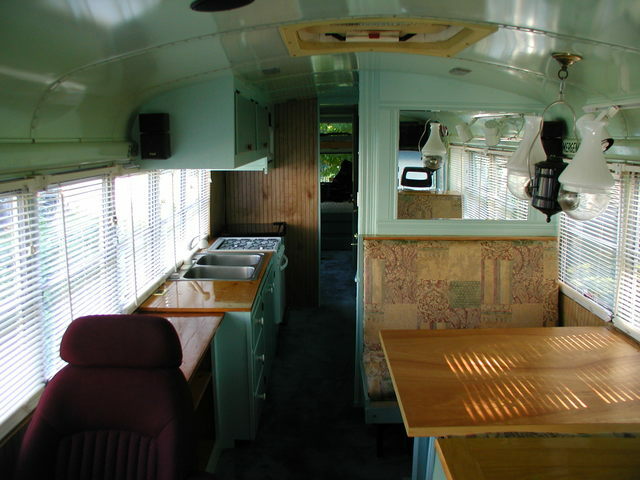 The bit of foam at the right and left will be covered with fabric to provide extensions to the bed. The standard futon size is just a little too short for me.